Tokova MasterCard - issues instant pre-paid international debit MasterCard's used to shop, talk and send money worldwide. Designed for those with global relationships, the Tokova MasterCard is built with a proprietary Talk N' Money Pal system, the next generation of pre-paid card capabilities that allows cardholders to select friends that share the benefits and features of the Talk N' Money Pal system. 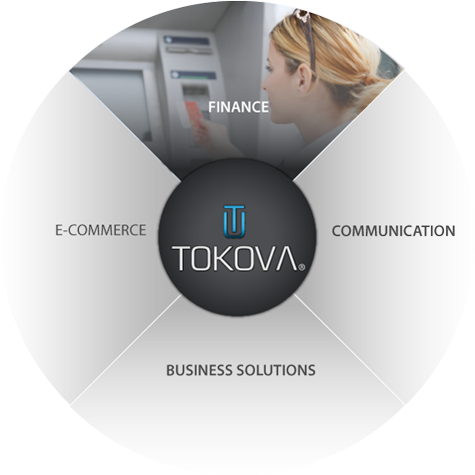 One pre-paid that combines shopping, talking and sending money worldwide, now that's the Tokova MasterCard! Tokova Money Hub - manufactures self service financial kiosks designed to be a convenient alternative to banks, check cashing stores and ATM's. Hosting over seven different integrated financial and telecom solutions, the Tokova Money Hub is a simply and cost effective way to conduct multiple transactions on the go. Built with enhanced biometric finger printing and facial recognition security software, the Tokova Money Hub is the next generation of the service banking - the teller that never sleeps!